NHL.com continues its preview of the 2015-16 season, which will include in-depth looks at all 30 teams throughout September. EDMONTON -- After an eventful offseason highlighted by the selection of center Connor McDavid with the No. 1 pick at the 2015 NHL Draft, the Edmonton Oilers are a much different team than the one that was 28th in the NHL standings last season. Not only did the Oilers win the NHL Draft Lottery on April 18, they also made sweeping changes to the front office and coaching staff before drafting McDavid on June 26. Two days after their fourth lottery win in the past six years, Edmonton put former Hockey Canada president Bob Nicholson in charge, naming him CEO of Oilers Entertainment Group. Before the week was over, Nicholson replaced general manger Craig MacTavish with former Boston Bruins GM Peter Chiarelli, who hired former San Jose Sharks coach Todd McLellan. The arrival of McDavid, along with the changes to management and behind the bench, has brought about renewed optimism in Edmonton. The Oilers have not qualified for the Stanley Cup Playoffs in nine seasons but are hoping their streak of futility will soon come to an end. McDavid is one of four No. 1 draft picks on the Oilers roster, joining Taylor Hall (2010), Ryan Nugent-Hopkins (2011) and Nail Yakupov (2012). Considered a generational talent and the most hyped player to enter the NHL since Sidney Crosby in 2005, McDavid adds to an already young and talented group of forwards. Along with its four No. 1 picks, Edmonton also features first-round selections Jordan Eberle, Benoit Pouliot and Leon Draisaitl. Hall, 23, is expected to be the catalyst of the group. Going into his sixth season, he has also emerged as one of the Oilers' leaders; he has welcomed a mentorship role with McDavid, allowing the rookie to move into his home. "For myself, it's exciting to have a guy like that come in," Hall said. "Whether he's 18 years old or not, he's got a ton of talent, and there's no question he's going to help our team. For him, it's just about making him feel as comfortable as possible. He's 18 years old, he's a young guy, but I think he's going to fit in really well with us." The highest-scoring left wing in the NHL two seasons ago (80 points), Hall struggled with injuries last season and had 14 goals and 38 points in 53 games. McDavid's arrival should take pressure off Hall offensively. "This year, I just want to take a load off myself, not put so much pressure on myself to change games and to be that guy every night," Hall said. "It's one of those things that has hurt me in the past, and I'm looking forward to just playing my game and trying to help out my linemates and help out my team as much as I can." Also taking some of the offensive burden off Hall will be Nugent-Hopkins, Eberle, Pouliot and Yakupov. Eberle, 25, was Edmonton's leading scorer last season with 63 points (24 goals, 39 assists) in 81 games. 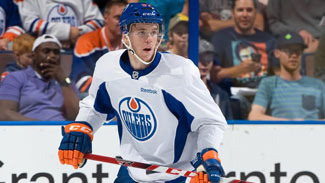 Nugent-Hopkins, 22, also had 24 goals and was second on the Oilers in scoring with 56 points in 76 games. "There have been some moves for us in the offseason and there have been a lot of positive things going on," Nugent-Hopkins said. "It's all looking up and it's all about getting out there and performing." Pouliot, selected fourth by the Minnesota Wild in the 2005 NHL Draft, signed a five-year contract with Edmonton reportedly worth $20 million after going to the Stanley Cup Final with the New York Rangers in 2014. He scored a career-high 19 goals in 58 games with the Oilers and is hoping to build on a strong season. "You can feel the atmosphere being different in the city and the guys in the room, it's going to be fun," Pouliot, 28, said. "There have been a lot of changes, a lot of things happened and they were all good." Keeping the puck out of their net has been a problem for the Oilers in recent years. They gave up the most goals in the League each of the past two seasons. In an effort to improve the defense, Chiarelli signed free agent defenseman Andrej Sekera to a six-year contract reportedly worth $33 million on July 1. The Oilers also traded for Eric Gryba and Griffin Reinhart, who was selected fourth by the New York Islanders in the 2012 draft. Sekera is the key addition, bringing to Edmonton a top-pair defenseman who can contribute at each end of the ice. He had a number of options this summer but felt the Oilers were a good fit for hm. "I saw the change up top and they were two guys that were successful in what they do,"
Sekera said of Chiarelli and McLellan. "Then I looked at the roster, and they have a lot of talent and a lot of youth. They are building something very nice here, and if they can be guided in the right direction, they can be very successful, so I'd like to be part of it." Along with Sekera, the Oilers are counting on Oscar Klefbom and Justin Schultz to each continue making strides in his development. Klefbom had a strong second half of the 2014-15 season, showing flashes of the player the Oilers envisioned when selecting him in the first round (No. 19) of the 2011 draft. He reportedly signed a seven-year contract on Saturday. Schultz, 25, is going into his fourth season with the Oilers after signing with Edmonton out of the University of Wisconsin. His 31 points (six goals) in 81 games led Oilers defensemen. "I had a good, very productive offseason," Schultz said. "I wanted to get bigger, stronger and more explosive. I feel like I've accomplished that, and it shows with the [fitness] testing we've done, and hopefully, it shows on the ice." The Oilers hope Cam Talbot helps resolve the goaltending issues that have plagued them over the past two seasons. Talbot, 28, was acquired in a trade with the New York Rangers at the 2015 draft. He's expected to be the No. 1 goalie, with incumbent starter Ben Scrivens serving as his backup. Talbot had a strong 2014-15 with the Rangers, filling in for injured Henrik Lundqvist for a portion of the season. Talbot had a 21-9-4 record in 36 games with a 2.21 goals against average, a .926 save percentage and five shutouts. Talbot will have competition from Scrivens, who wants to regain the No. 1 job. Scrivens was inconsistent last season, prompting the Oilers to acquire Talbot. Scrivens was 15-26-11 with a 3.16 goals against average and .890 save percentage. "There is always competition, it doesn't matter what team you're playing on," Scrivens said. "Whether it's minor hockey or in the NHL, you're always prepared for competition. People are always trying to steal your job, trying to work harder than you or play better than you, so they can have those opportunities. It's not different than any other year that I've played, there is always competition for jobs, and at the end of the day, that makes the organization better." With McDavid, Hall, Nugent-Hopkins, Eberle, Yakupov, Pouliot, Sekera and Schultz available to the Oilers on the power play, opponents would be wise to stay out of the penalty box. The Oilers power play was among the most efficient in the League after Todd Nelson took over as coach from Dallas Eakins in December. Bolstered by McDavid and Sekera, Edmonton's power play should be among the NHL's best. "There are a lot of guys that can play the power play on this team, that's for sure," Pouliot said. "You can never have too many. I think that was our most consistent thing last year and I'm looking forward to what the coaches do with it this year." The penalty kill is another story. Edmonton tied for the second-worst penalty kill in the NHL last season (76.7 percent). The addition of Sekera may help in that regard, but unless McDavid proves to be an exceptional penalty-killer, the Oilers will need someone else to step up when they're shorthanded. Veteran center Mark Letestu, signed as an unrestricted free agent in the offseason, could be that someone, but the onus will fall on McLellan and his coaching staff to improve the penalty-killing unit. The Oilers hired McLellan on May 19, four weeks after he parted ways with the Sharks after seven seasons, including three Pacific Division titles and six playoff appearances. With an opening after firing Eakins and finishing out the 2014-15 season with Nelson as interim coach, Edmonton was quick to offer McLellan the job. He was announced as coach after guiding Canada to a gold medal at the 2015 IIHF World Championship in the Czech Republic. McLellan is the Oilers' seventh coach in the past eight seasons, but he is expected to stop the recent coaching carousel in Edmonton. "We're all hoping so," Hall said. "People always ask me what the biggest difference is when you're transitioning with coaches. It's not really the systems, it's more about what kind of environment the coach projects, how he runs his meetings, what the daily schedule is. I think we're getting a taste of that already, but from what I experienced at the Worlds, it's very player-friendly, but at the same time, I think the onus is going to be on the players this year." McLellan brought assistants Jay Woodcroft and Jim Johnson to Edmonton from San Jose, keeping continuity on his staff. "We have to do a very good job of teaching," McLellan said. "We can't skip over details. Moving from first grade to third grade would be a mistake on my behalf."????????????????????????????????????????????????????????????????????????????????? McLellan is also responsible for McDavid's development in his rookie season. He will determine how the talented rookie center is used in the lineup. "I think if you put some truth serum into [McDavid], he probably just wants to be an 18-year-old and fit in like the rest of them," McLellan said. "He doesn't want to be treated special or anything like that. But when you have that skill set and you've had it that long, then that [special] environment is created for him."